Lisa Colby is a Suffolk based, registered Senior Teacher with Yoga Alliance, she has been teaching full time for more than 10 years and practicing for almost 20. 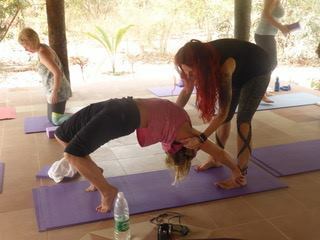 Lisa has practiced and trained in many different styles which she now blends into creative classes that express her love of sharing and teaching yoga. Lisa teaches in a spiritual but down to earth way, her approach is light hearted and sensitive, encouraging a sense of balance and clarity through embodied awareness and breath centred practice. There are classes that are creative and powerful, in which you can expect to build heat and strength, plus sessions that are so light the whole experience is centred around the release and unwinding of tension. Retreats are taught in a progressive way that assists deepening awareness throughout the week. Morning practices are usually more dynamic whilst evening practices are more restorative, exploratory or technique based. Classes will be suitable for all levels of experience and will include and engage all attending.